Irish Views on the American Civil War- Does Ireland Need a Memorial? I was recently interviewed by one of Ireland’s main online news websites, the Journal.ie, about the Irish in the American Civil War. You can read the published piece here. The main thrust of the article followed one of my recent posts, Ireland’s Forgotten Famine Generation, which discusses how those in Ireland do not realise the extent to which the American Civil War affected Irish people, given that there were 1.6 million Irish people living there in 1860. It also touched on the lack of a national memorial to the Irish who experienced the war, and the general lack of recognition they receive from the Irish State despite our pride in the global Irish diaspora. All of the above opinions are reasonable and valid, and provide an insight into how some people in Ireland may view a memorial to those affected by the Irish in the American Civil War. I will be putting together a post in the coming days where I look at each of these points in turn and offer my views- in the meantime what do you think? It is a thorny question. Americans themselves have not yet fully resolved how to commemorate/honor our own epic conflict. In many ways the accepted Irish-American historiography sells the Irish short, even dumbs them down to fit post war political realities. (ie Coyngham’s remark that Irish soldier in the war “was not going to fight for an abstract idea.”) While the Irish Brigade and Meagher, long the focus of scholars may have captured the eye of historians, they had little impact on Ireland. Indeed it is a shame that Meagher refused to condemn slavery. On the other hand you have units that historians have long shied away from, such as the Corcoran Legion, which altered Irish history. The Irish Legion consisted of the core of the Fenian Brotherhood in America. They consciously entered the war AFTER it became a war to end slavery and men like Corcoran and indeed John O’Mahoney were abolitionists at heart who believed in universal human freedom. By forming the Corcoran Legion and the ensuing death of most of the Fenian leadership led directly to the failure of post-war Fenian plans. Corcoran, Murphy and others who initially opposed involvement in the war to preserve their fighting force for the Liberation of Ireland, sacrificed their dreams and their lives for the Idea of Human freedom. They should be remembered and commemorated. I doubt if the Irish of the 1850s left willingly. I’m sure my own ancestor and his younger brother were sad to leave their homeland. I doubt that they had a choice because of the famine. They weren’t really welcomed in America. Many businesses had signs that said “No Irish need apply.” Yet, they persevered and 180,000 Irish fought for the Union. Why? Who knows? For a steady paycheck? Adventure? To preserve the Union? My own ancestor left a wife and five children to go off and fight in the Union Army. I rather think that he did it to become an American. If the Irish don’t want a memorial to their brave sons who exhibited the highest form of love of country, then the hell with them. There are plenty of them here. I am reminded of one that I saw at Antietam, “To our brave sons who died here.” I think that says it all. Most made it home in one piece and prospered. After all, we’re the proof and that’s the best memorial of all. PS Tomorrow night two sons of Ireland: Joe Biden and Paul Ryan, will debate in the VP debate. The first is the first Irish Catholic VP, the second wants to be the next. I should preface by saying I’m an American. The question is not for me to decide, nor should it be. It is, however, a fascinating subject that ties into many overarching questions regarding migrant, hybrid identities. In that sense it is entirely relevant to me. I know many non-Americans find it curious how many Americans think of themselves in terms of hyphenated ethnic backgrounds. Am I simply an American, or am I an Italian-Irish-Swedish-American? Maybe this is American arrogance on my part, but I think of hyphen-ization not as a marginalizing perspective, but rather as an acknowledgement of the various paths that come together in the US. I view my own country as an extension of the hopes and dreams of the immigrants who came here, and thus an extension of their peoples’ histories. The Great Famine and the Holocaust, for example, are two horrifically tragic, foreign events that brought countless new Americans to our shores, the horrors they survived and the cultures they brought with them changing the fabric of our people as a whole. Both events are remembered in memorials in the US. They are unquestionably a part of our story. 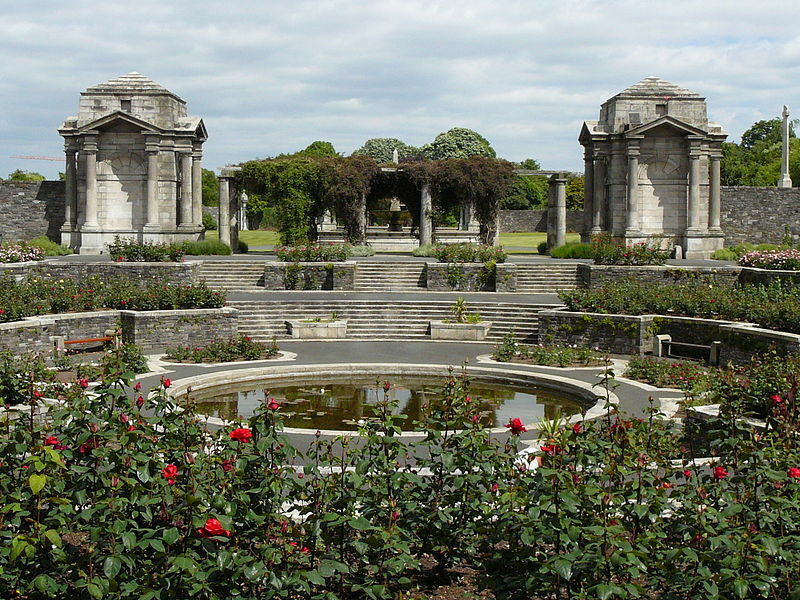 When discussing an Irish Civil War memorial, we are essentially discussing the opposite question: a nation memorializing a tragic event involving its emigrants to a foreign land. I may see the US as an extension of the peoples’ from whom we are built, but those peoples may not see it that way, and I cannot say I blame them. I sympathize with the commenter who asked, “Why do we need memorials to those who kill one another no matter which side they were on? It says much about human nature or at least how daft it is.” If we do memorialize wars–which I think we should–we should never aspire to simply aggrandize the heroism of wars’ participants without a real reflection on the devastating breakdown of leadership and imagination that causes and perpetuates war. The Civil War was horrific, and horror is at least as central to understanding it as anything else. Many Irishmen died like poor John Hines in Damian’s recent post–in unimaginable pain. Many were lied to and betrayed, promised bounties they never received in full when they were supposed to, conscripted, or forced, like the soldiers of the 9th Connecticut (Irish) Infantry, to labor under deplorable conditions with inadequate supplies, water, and sanitation. Thousands of Irish-Americans died of exhaustion and disease, likely more than died in combat. But this, too, is part of our shared history. I am an American and a person of Irish descent. I do not know what could possibly be carved into a piece of stone to do justice to the myriad experiences of Irish-Americans in the Civil War years. But I believe it is at least worth the deliberation of the Irish people. Thanks all for your excellent comments! I think the majority of people here (in Ireland) would be in favour of a memorial if it was put to them, but the key battle is to raise awareness of the American Civil War with them first. I think if more people understood the conflict and the Irish experience of it there would be much more of a move to see recognition. Irish Americans should not despare at the most loudest whio are often the most ingorant. Ireland owes Irish America. I say that as a Irish person with no special selfish bias or motive for America itself. My respect is for your ancestors who were often victims. The last comment by Damien is correct. It is a matter of awareness here in Ireland. Great site. Thanks for the read. How many Irish died in the Civil war? Many thanks Murphy, I am glad you enjoy it! There are no exact figures for the Irish dead- it is actually something I am hoping to do a post on- all we can do is loosely base it on the percentages who served and look at the overall Union and Confederate fatality rates. There is no doubt that it ran to many thousands- cetainly worthy of remembering. The Irish Brigade alone lost 4,000 killed and wounded. Three of their brigade commanders out of the five were killed. Major General Winfield Scott Hancock numbered his Irish Brigade as some of the finest soldiers that he commanded. At Fredericksburg, the Irish Brigade charged the stone wall defended by their fellow Irishmen. I am a proud descendent of Sgt. Michael Patrick Murphy of the 61st NY Volunteer Infantry. He was a veteran of the 1862 Peninsula Campaign, the Seven Days Battles and Antietam. The Irish volunteers found that by the end of the war they began to be accepted by native Americans. There’s a story that at the very end of the war, a unit of Irishmen advanced too quickly and were captured. A Confederate officer demanded the national flag that one of them was carrying, “Hand over the flag, Yankee”. The Irishmen replied that after ten years in America, it was the first time that he had been called a Yankee and handed over the flag. 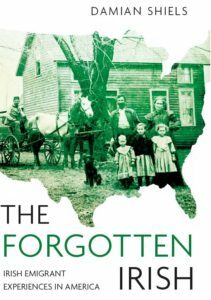 The Irish who fought in the American Civil War on both sides by and large found what they were looking for in America: freedom and the American Dream. We who are their descendents are their legacy. I believe a key component of understanding and commemorating it is to shed much of the past 150 years of historiography that was written to suit the political whims of the time and convening culture and has thus been enshrined as fact. In America we have enshrined a Irish Brigade Centric view of Irish Participation in the War. We have also enshrined post-war and twentieth century sensitivities into the discourse. Ie in the period of reconstruction it became a “war to preserve the union” and in the “melting Pot” era The Irish fought to “become American.” Yet my research into the 69th NYNGA of the Corcoran Legion (The MOTHER Fenian Regiment) has shown that much of what was written is Bunk. This is not to take away from the exceptional gallantry shown by the Irish Brigade. Conyngham is wrong on many critical points that are taken as fact (Including the famous stat that 500 men from the 69th NYSM joined the 69th NYV – it was fewer than 70 according to Federal Records) as well as slighting the Irish by saying in his introduction that Irishmen were incapable of fighting “abstract” ideas – ie abolishing slavery. Yet my research has indicated that the Fenian Leadership was primarily pro-abolition and saw the destruction of Slavery as imperitive not only for the fulfilment of the American promise but for the good of all mankind. Also, what if the notion that The Irish came to America with the intention of permanantly staying is not correct. What if the Irish like many other groups had planned on going home eventually and America was but a temporary haven?